It's finally here! Polymer Clay 101 is now in stock at various bookstores online (more on where to buy it below). I co-wrote Polymer Clay 101 with Kim Otterbein: she wrote the basics chapter and the first 11 projects, while I did the last 10 projects and "starred" in the accompanying DVD. Book-writing is so much more solitary than blog-posting — there's a lot of hours of work and a lot of waiting without feedback. So I'm excited that I finally get to show you what I've been up to & see what you think! Polymer Clay 101 would be great for a polymer clay beginner. The first 33 pages cover all the basics — tools, techniques, color mixing, mold making, sanding & polishing, etc. After that, 21 projects demonstrate major polymer clay techniques. We show how to do important things like Skinner blends and caning... but we also show some more unusual techniques like using an extruder for a filigree look, and carving baked clay. The 45-minute DVD shows each of these techniques in action — great for visual learners! Have you seen the IPCA Synergy2 Exhibition? They asked nearly 60 amazing artists to explore collabroations with polymer clay and mixed media. They also asked me. :-) I'm humbled to have my name listed with so many polymer clay greats. You can check out my entry here, and the rest of the gallery here. The pieces are available for sale online now or at the Synergy2 event in February. More details about my piece are available here. I've been asked to co-author a polymer clay book! It's called Polymer Clay 101, and I'm writing it along with Kim Otterbein. The publication date is currently scheduled for January 2011. Of course, my part needs to be done much sooner than that, so posts here may be a tad sparse for a little while. Writing a book has been a long-time goal of mine — the kind of big goal you're almost afraid to talk about because you're afraid it won't happen. So I'm very excited for this opportunity. I have a lot to learn, but I've really enjoyed the work so far. Hopefully, once the book it out, you'll enjoy the projects as much as I have! Polymer Clay Retreat: I'm Going! Christi Friesen will be doing a day's worth of demos, plus there are demos scheduled with Judy Belcher, Seth Savarick, Kathi Gose, Julie Picarello, Lorrene Davis, and Lisa Pavelka. So it really looks like a great event! Anybody else out there planning on going? Any tips for a new attendee? I'm honored to be today's featured artist on Cyndi Lavin's Layers Upon Layers site. Check it out & enjoy! Hey folks... Just wanted to mention I'll be teaching at tomorrow's meeting of the Central Oklahoma Polymer Clay Guild. 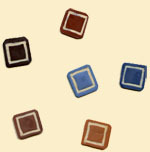 The project is Rubber Stamped Polymer Clay Coasters, and I think it'll be a fun one. I'll be teaching some basics of using rubber stamps with polymer clay and going over some interesting techniques — plus I'll have a big ol' stack of rubber stamps for folks to play with. If you're in this area, I hope you'll come by. Here's the meeting info. For folks who aren't in the area, here's a couple of online places you can find me. Twitter. If you're not familiar with Twitter, it's somewhere between a chat room and a mini-blog. My Twitter username is craftygoat — feel free to "follow" me if you're a Twitter-er too. I tend use it for quick, random thoughts — some craft-related and some not. GoodReads. While I've had an account on GoodReads for a while, I've mostly used it with local friends. I hadn't really considered using it for crafty books until Lisa at Polka Dot Creations mentioned it. I'd love to connect to some other crafty readers — so feel free to link up if you're using their site, too. Etc. I've added these two sites plus a few others under the "Find Me Online" section on my About page. If you're into the whole social networking thing, check it out. Hope to see ya soon — whether it's in person or online! The folks at Amazing Mold Putty contacted me a while back. Apparently they enjoyed some of my photos & videos, and wondered if they could use them on their website. I agreed, but forgot to check it out until a couple of days ago. They've included several links to this site from both their Instructions and Gallery pages. I mention this for several reasons. I'm glad they liked the photos enough to feature them, and I wanna welcome folks who are visiting from their site. (Welcome!) But I also mention it because it prompted me to set up a "Related Entries" feature, which you should start seeing at the bottom of each post, just below the words "Like this? You might also like..." This list of related articles is automatically generated based on how I tag my articles. If I've tagged an article with "Amazing Mold Putty," it should link to similarly-tagged articles. Which means that all you new folks who followed the Amazing Mold Putty site's link to this older tutorial will hopefully also find your way to the one I just posted recently. While I was tinkering under the blog's "hood," I also added another feature we've been needing for a while: Comment Subscriptions. If you want to be notified when new comments are added to a blog post, just checkmark the "Receive an email when..." box when you comment. This is especially useful for folks who are asking a question -- now you can get notification sent to your inbox, instead of having to check back frequently for answers. I'll be manually updating tags on older posts over the next few days, so those of you reading this through a feed reader may get some older items marked as new (sorry!). Aside from that, I'm hoping these new features will work seamlessly. But if you have any problems, just let me know. 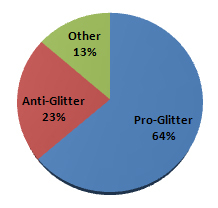 Looks like I am in the minority, as a crafty "glitter-hater" -- but at least I'm not all by myself! Penni Jo for her pro-glitter comment: "All glitter has its own charm and place in the world." Beth for her anti-glitter comment: "Add glue to the mix and it becomes a blob monster determined to get me! I can't handle it without it taking over every thing I own." I'll be contacting the winning commenters shortly -- so if you're one of them, be sure to keep an eye on your email for instructions on receiving your prize. Dez likes the glitter cloud that rises up when she sits in her favorite chair. Jenny's son was born with glitter on his head. France mentions the difficulties of being taken seriously in a business meeting when you've got glitter on your face! The winner of the mold putty project pack is Vicky. Vicky, I've sent you an email to get your address info, so I can send the goodies your way. Thanks to everyone who shared their ideas for using molds! Just wanted to pass along information about a couple of charitable opportunities going on right now. I hope you'll participate if you're able! Bottles of Hope On-Line Auction: Some of the top Bottles of Hope from last year's challenge are being made available through this online auction. All proceeds go to Hasbro Children's Hospital. This is a wonderful opportunity to purchase beautiful polymer clay work from well-known artists (such as Dotty McMillan & Lisa Pavelka) -- while also helping a great cause. Auction ends June 20. Choose a charity you want to support. Choose a gift you can afford. This is not a competition to show how much spare change you have though - the smallest gift is all that is required and will be a very generous thing to do for someone. Nominate your swap-bot partner to receive the gift. If you don't already have a charity in mind, I would recommend Heifer International. (My husband & I met on a college trip to Heifer -- so it's a sentimental favorite!). Their gift catalog shows available options (or click Express Giving for a complete list) -- with giving levels including a share of a goat ($10), a flock of chicks ($20), honeybees ($30), goat ($120), and more. Sign up by June 8. Congratulations to Jackie Young! My husband randomly selected her comment, so she won her choice of my "That's Clever" projects. Jackie selected the Mailbox Desk Set, so I'll send that her way. Thanks again to all those who entered. My craft desk is always pretty crowded... but it's absolutely overflowing now that I've moved all my "That's Clever" stuff back in. I've got at least a dozen projects from the show -- in various stages of completion -- that I don't quite have room for. Leave a comment on this blog post, telling me what's on your craft desk. Leave a relevant comment on any other post on this blog. Leave your comments between now and Monday, May 28. Make sure to fill out the email address on the comment form, so I can contact you if you're the winner (don't worry, that field isn't published). I'll randomly select a commenter, then announce the winner on May 29th. Just a quick note to say I'll be in Austin this week attending SXSW. I recently joined my husband full-time on our web development business, and I'm really looking forward to an inspiring week with some exciting online innovators. I haven't had a chance to decide my whole schedule, but I do know I'll be at BlogHer's Friday night Meetup and Boss Lady's Saturday session. If you're going to SXSW, let me know -- I'd love to chat! How do you design a crafty blog? 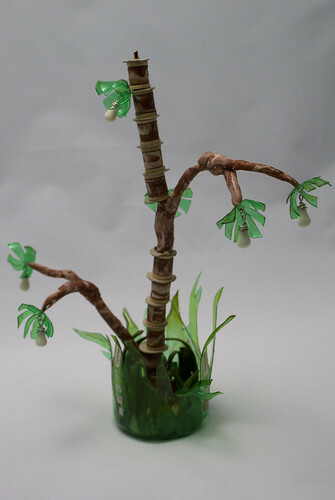 Well, with Photoshop, a little imagination... and of course, some polymer clay! At least that's how we did the recent design here at CraftyGoat's Notes. The site design has been a work in progress, and there's still a few tweaks to make. But now that it's mostly complete, I thought I'd share a little about how we did it. Hey, folks! Welcome to my new blog, devoted to all things crafty. I plan to use this spot to talk about projects I'm currently working on and review new crafting products I've tried. And I'll probably post some craft instructions now and then, too. I work primarily with polymer clay, paper crafts, and hemp jewelry, so many of the posts will relate to these materials. I believe crafting -- like life -- is all about trial & error, experimenting and tweaking to get the best results. So I plan to share some craft tips and techniques that have -- and some that haven't -- worked for me. Feel free to tell me about your experiences too -- if you've found a better way to do something, I'd love to hear from you. I make and sell crafts for CraftyGoat.com, so I'll probably also talk now & then about Crafty Goat, and more generally, about the business of crafting. I hope you'll stick around -- I look forward to chatting with you!